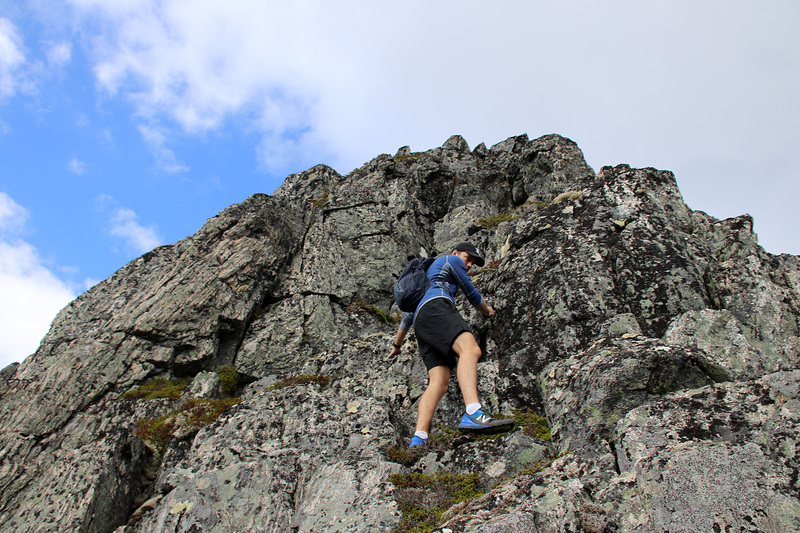 Saturday: On Thursday, I invited some of my colleagues to a hike and scramble up Trollråsa on Sukkertoppen in Ålesund. None of them had ever done something similar before. You can read about that on the “2018 Week 36″ report. One of these colleagues was Fredrik Giske. He showed so much “talent” in steep landscape, so I texted him on Friday afternoon and asked if he was game for Fingeren on Saturday. Not quite knowing what “Fingeren” was, he accepted. I guess he assumed that it would be a blast, coming from me. Fingeren in foreground. Kolåstinden in the background. 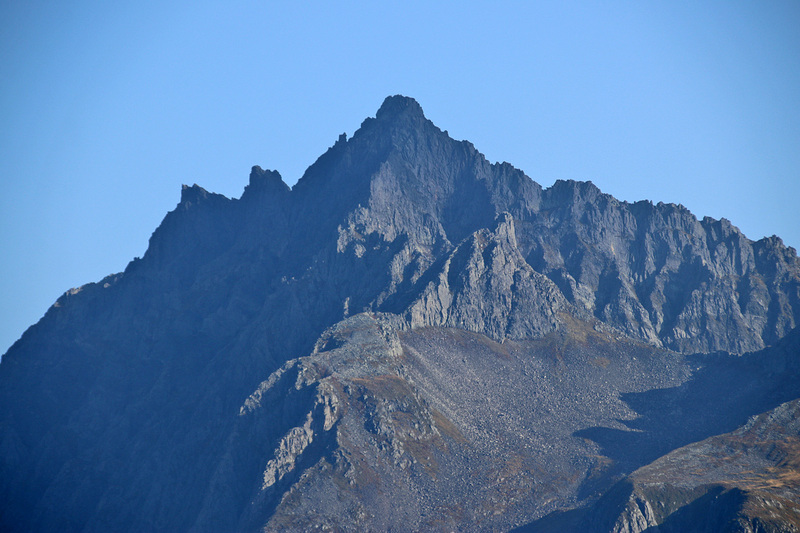 Fingeren is a pointy top on the Kolåstinden massif. You can easily scramble this top without a rope, but there are many places where you cannot slip or fall without a consequence. I would never take someone up here that I didn’t think could handle themselves. After watching Fredrik scramble in Trollråsa, I was confident that he look after himself. 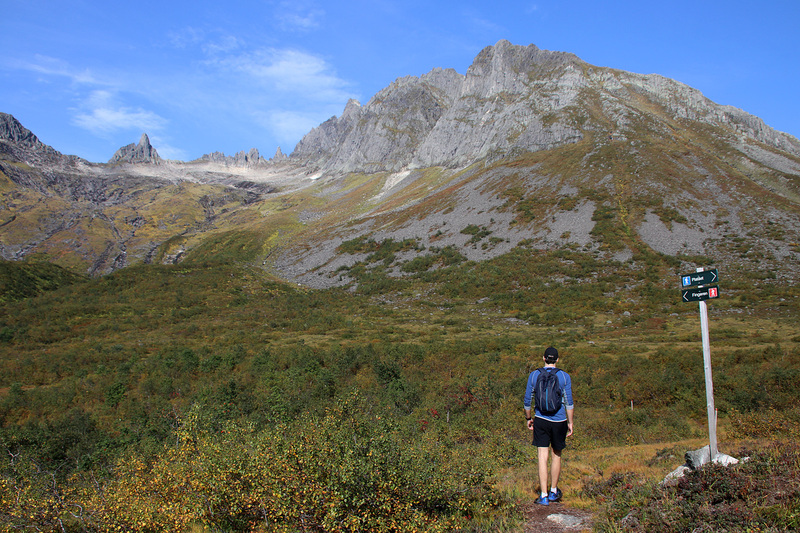 And I hoped that Fredrik would remember this hike for a long time. After all, it’s borderline what is normal to do without a rope. We met at the trailhead in Standalsdalen, in nice weather. The forecast mentioned rain in the afternoon, and I wanted to be off the mountain by then. We headed up the normal route, and eventually joined a girl who had never been here before, but had planned to go to the top. I decided to “interview” her (in a friendly manner), and in the end I suggested that she should go up and “feel” the mountain, but definitely not attempt a climb unless she felt absolutely certain about it. And when we reached the foot of the peak, she seemed happy just to sit down and take in the views. Fingeren is an easy climb if you choose the right moves, and so I decided to give Fredrik “favorable suggestions“, as we started to climb. After all, I know this peak quite well by now. Well knowing he could think of me as the plague after a while. But polite as he is, he took my advices without any complaints. Fredrik and Fingeren – ready to scramble! The initial climb/scramble is fairly easy, yet exposed. Then follows a short traverse that is also quite airy before you face the final section – which is both more tricky and airy at the same time. I suggest you watch the video clip to get an impression of the climb. Fredrik behaved just as elegant and safe as I had hoped for, and eventually we reached the top. 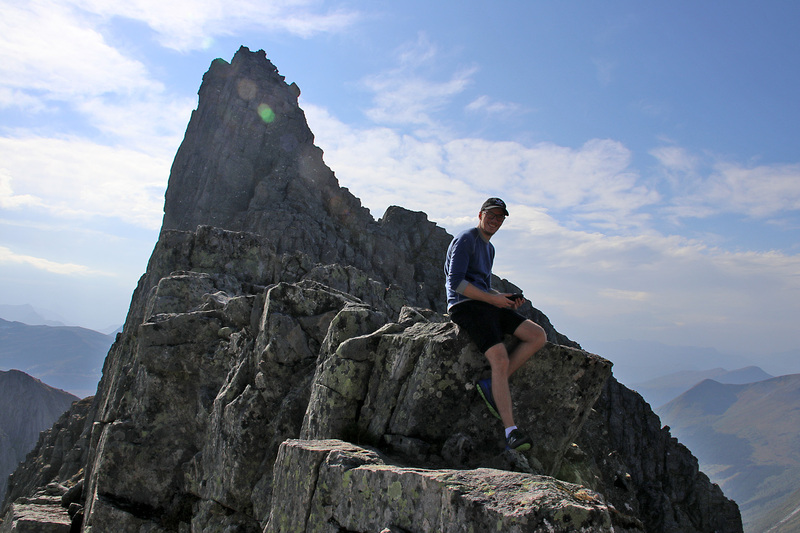 It was very nice to Fredriks reaction when we reached the summit cairn. 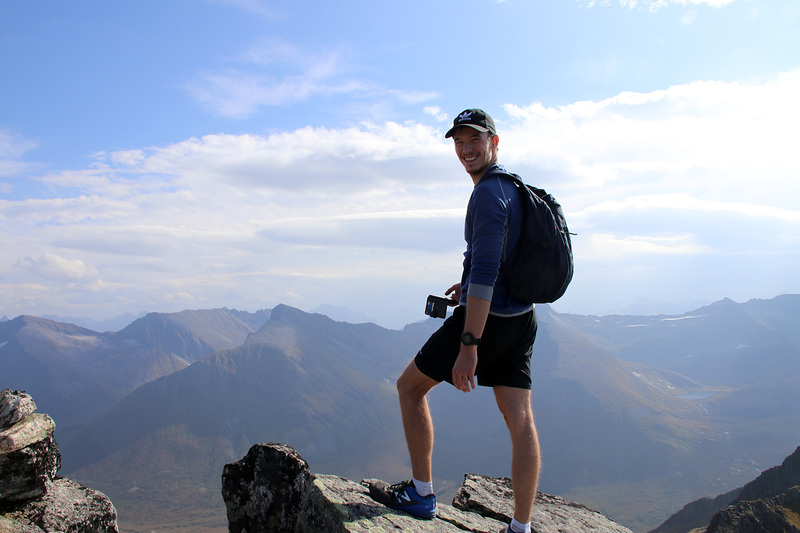 It seemed definitely worth his while, both in terms of the drive from Ålesund and the hike and climb. We took the same route down to the foot of the peak, making sure every “step mattered”. We got a little rain in the lower part, but it didn’t amount to much. 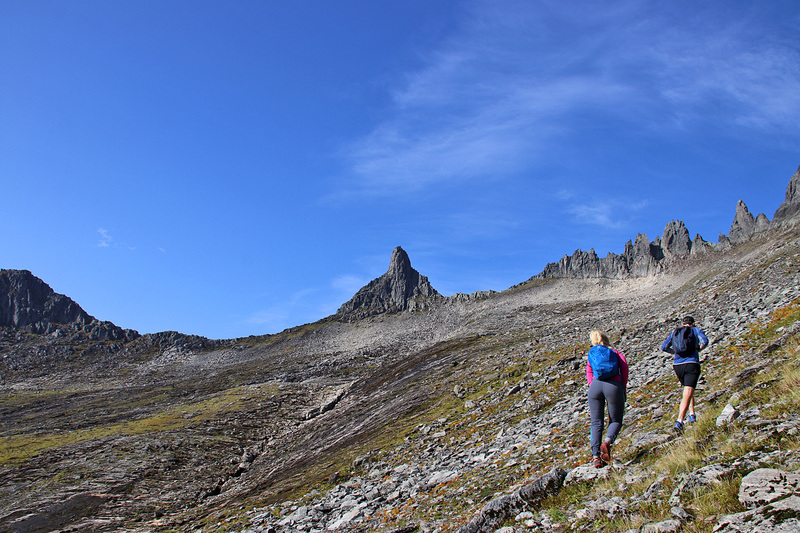 As we were in a good scrambling mode, we decided to scramble further up the ridge, in the direction of Kolåstinden. No particular goal, just wanted to see how far we got. When we got to a steep section where we didn’t quite trust the rock, we decided to turn around and return to the trailhead. Many thanks to Fredrik for “great sportsmanship” and great company!